It started as a tribute to Jewish Hungarian heritage. Where it will end - nobody knows. Right now it‘s a wild ride back and forth through time - deeply rooted in the folk tradition, crossing genre borders unrestrained, pedal-to-the-metal and rocketing forward. 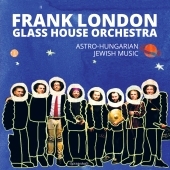 Thrill, adventure, zest - Frank London‘s Glass House Orchestra is what music is all about. "Astro-Hungarian folk punk" is how Grammy winner and Glass House bandleader Frank London from New York City approximates what the group‘s celebration of the Jewish Hungarian folk tradition has rapidly grown into: standing on the shoulders of Eastern European folk, wild and free as the punk revolt, reaching for the stars! The Glass House Orchestra is a supergroup of eight acclaimed musicians with various backgrounds in four different countries and two continents. They‘re well aware of history, yet totally here and now. They throw together whatever they have - there is no end.